I remember that both the Commodore C-64 and the Amiga had a thriving public domain, demo and freeware scene. While it was overshadowed by commercial games and applications, it was there and some of the games produced by enthusiasts were well done. If you look at the PC you will find that freeware games and games developed by independent developers are on the rise in last years. While most games cannot be compared visually with full priced computer games, some reach the same level of quality in areas like gameplay or story. Especially flash based games have made a huge leap forward in terms of quality. Windows users who want to keep up to date with recent developments need to find ways to do so. They can follow specialized sites like Indiegames, YouTube video channels like that of The Cynical Brit or the Game Saturday series here on Ghacks. But even if you follow several channels you will probably still miss out on some of the better games. Game Downloader is a free software for Windows that is more a less a constantly updated game download manager for free Windows PC games. The portable application displays a listing of popular free games in various categories that can be downloaded directly from within the program's interface. You pick a game category first. Available in the pulldown menu are game types such as turn-based strategy, puzzles, board games, first person shooters and sports games. The list of available free games is the populated after the category has been selected. Each game is displayed with its version, a screenshot and game information. There are also links to YouTube, the game developer website, options to get the file size and to download the game. 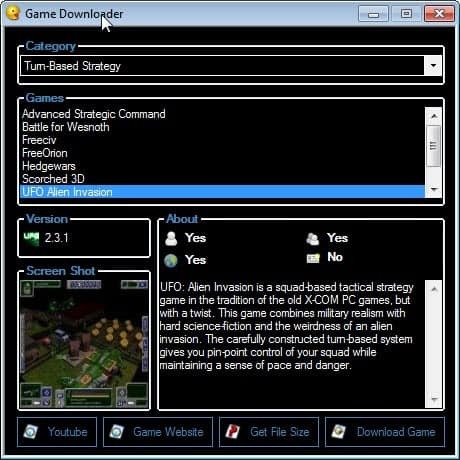 Many great free Windows games are listed here, from Battle of Wesnoth and Freeciv in the turn-based strategy game section over Warsow and OpenArena in the first person shooter category to popular card and board games like Risk, Solitaire and Poker. Game Downloader on the other hand has a few shortcomings. A search is missing, as are detailed information like compatibility or sub-genres. It would have also been nice if the program would offer to download all games from a selected category automatically. The Pc game downloader furthermore does not highlight games that have already been downloaded or installed previously. Very cool. Another nice thing about most of the good freeware games I’ve seen is that they usually have linux ports available. Also, Bombermaaan is the best SNES-style bomberman clone I have ever seen. Wow. Great :) I became addicted to freeware games last year, and I’m just looking for something like that – catalogs, portals, searching for something new. I personally think that this is the biggest issue. For commercial games, you got paper mags and online sites that review them all. For indie games or freeware games, you do not have that one authority site that covers them all. Might actually be worth creating such a site. Opening The Settings Window: Right-click on the program’s icon in the “task tray” or “notification area” and click on settings.